Atlas has been working on the new High West Distillery expansion in Wanship, Utah. High West was named “Distiller of the Year” in 2016 by Whisky Advocate,  America’s leading whiskey magazine. The project consisted of demoing the existing platforms and installing new elevated walkways to access the tanks. Eight to ten tanks needed to be relocated to make room for the new process tanks. Atlas fabricated three new larger tank stands. 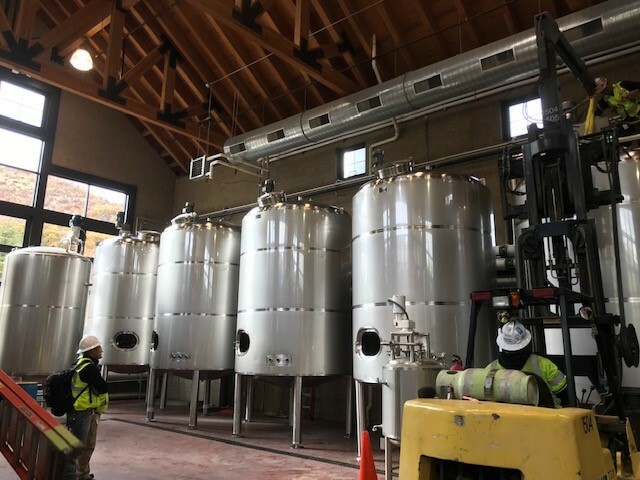 The team then installed two grain silos and rigged in a variety of fermentation tanks, blending tanks, yeast tanks, spirits tanks, and more equipment that completes the four processing stages; malting, mashing, fermentation and distillation. Atlas is also installing the mill house equipment with a new grain handling system. This system includes a grain cleaner, de-stoner, weight belt, grain mill, surge bins and the conveying system. What a great project and great people to work with.